You lucky lot are in for a treat as Jacob is taking the reins once more and reviewing the latest app from the Hopster family. Thank you Jacob! As a child of the ‘80s, I’ve had fun with computers ever since first school. I distinctly remember doing my maths as fast as I could as the reward was playing Dare Devil Dennis (you can play it here) on the BBC Micro in our classroom. A couple of years later, I was introduced to programming via the wonder of the Logo Turtle. We’d push some buttons on it’s back and it would trundle around drawing shapes on the floor for us. With this in mind, I often wonder about the right time to introduce the kids to programming. 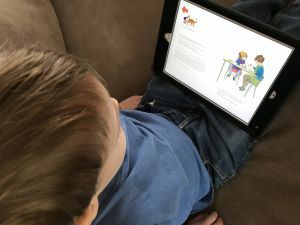 I’m firmly of the belief that the most useful things for kids to learn is creativity and problem solving as learning to code is something that can be picked up in later life. Jo reviewed the Hopster service last year and our son has continued to use and enjoy it since. 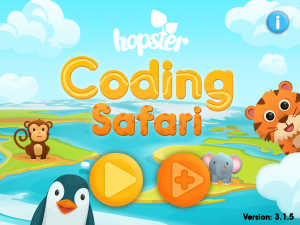 Hopster have now released a free coding app for the iPad – Hopster Coding Safari! I thought I’d take it for a whirl and see what it’s like. 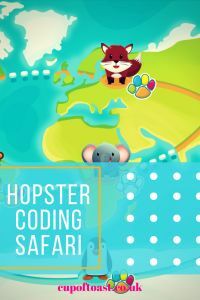 The app is graphically similar to Hopster TV and Learning, but themed around safari animals. 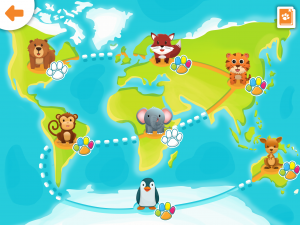 You start with a world map, taking you round the continents as you complete each set of puzzles. You pick an animal and then complete a series of 5 tasks before returning to the map for the next one. 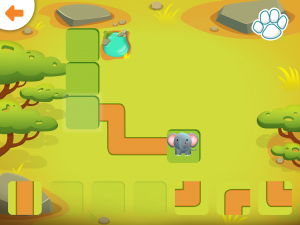 The app starts you off with fairly straightforward pipe type puzzles, asking you to drag and drop the pipes for the animals to move along. These are teaching you how to order commands to instruct your animal to move along the path. As you progress further through the levels, the pipes then swap to arrows. This becomes a little more instructional now, abstracting away the path the animal has to follow from the task at hand a little. The app then introduces the concept of loops by creating multiples for a given command. Finally, rather than placing the commands on to the route you’re following, you drag them to the bottom of the screen creating mini programmes. Further complexity comes from asking you to solve multiple routes on the same page. The puzzles present lots of repetition for a concept before slowly building on what you’ve previously learnt. Due to this repetition it might take your child a while to get through to be introduced to the next concept. Although, it’s pretty quick once you know what you’re doing! 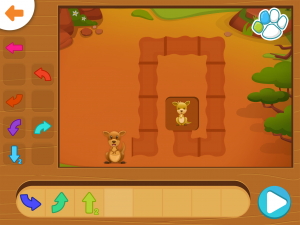 By completing each set of 5 puzzles, you earn picture stickers which you can place in your own safari picture scene. You can also earn extra stickers by completing additional side puzzles. This encourages you to carry on and provides a nice visual reward for your achievements. I think the app does well to build on programming concepts for younger minds, rewarding you as you go along. To try it out for yourself, please visit here! It is currently free to download and play, and I should mention that it is also ad free. If you enjoyed Jacob’s post, do pop over and check out my review of Hopster TV and Learning. N.B. This is a collaborative post. For more information, please refer to my disclosure page.